I don’t normally pay much attention to the search terms people use to stumble upon my blog. Most are pretty self-explanatory. But a few weeks ago, I started noticing that more and more people found their way into this space looking for ‘chickpea meringue’. Colour me intrigued. At the same time, and purely by coincidence, I came across pictures of chickpea water foam on instagram. Soon enough, I also became one of those typing ‘chickpea meringue’ into google, curious to see what results would come back. As it turns out, the water left over from cooking chickpea and other legumes like beans or lentils, usually a slimy and slightly opaque affair, something I have been pouring down the drain for years without giving it much thought, can be whipped into a foam firm enough to rival beaten egg whites. Moreover, unlike flax seed meringue (which, although a wonderful alternative to eggs for certain applications, does not like heat much), chickpea foam can be cooked in the oven to produce meringues or cakes and even macarons. And while I am still not a vegetarian or a vegan, I love the fact that there is such a simple substitution for egg whites that means many traditional recipes relying on egg whites can be reproduced for those not eating eggs (whether out of choice or for health reasons). 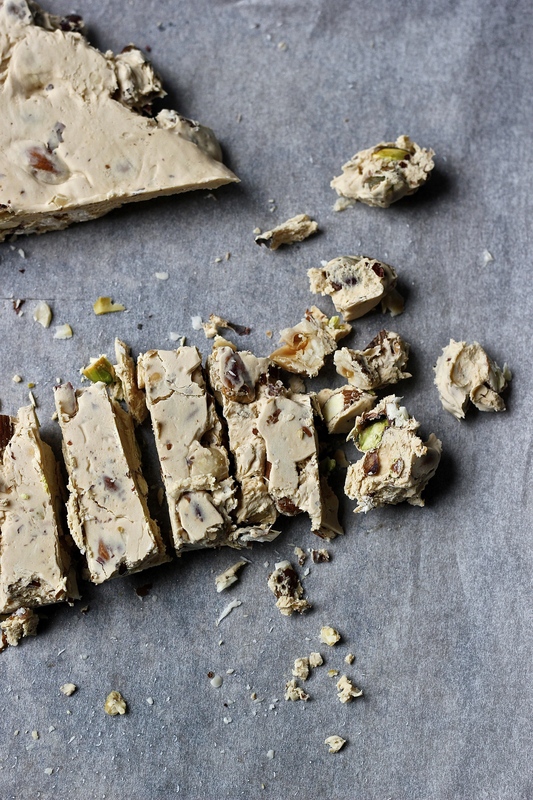 After baking my first batch of meringues, I decided to branch out and try my hand at Torrone. Various baking, granola and nut milk experiments mean I frequently end up with odds and ends of different nuts and I figured there was no better (or more delicious) way to use these up then to fold them into torrone. And the results are wonderful, there is not even the slightest difference in flavour or texture as compared to traditional torrone! Note: This makes a hard torrone that will gradually soften somewhat over time. It is studded chock full of toasted almonds, hazelnuts and pistachios. While traditional recipes often call for almonds alone, I love using a mix of different nuts (or even some dried fruit) so that each bite tastes a little different. This makes ca. 2 long bars of torrone, ca. 24 pieces in total. You will also need a sugar thermometer. 1. Cover a sheet pan with parchment paper and lightly oil the parchment paper with some neutral tasting oil (e.g. sunflower or almond). Set aside. 2. In a large sauce pan heat the caster sugar, the water and the honey until all the sugar has melted. Bring to a boil and leave to cook until the temperature of the sugar reaches 149 degrees Celsius. This will take ca. 25 minutes. 3. While the sugar is boiling, whip the aquafaba until it forms soft peaks. 4. When the sugar syrup has reached temperature, switch off the stove and let the sugar syrup rest for 1 minute. 5. While continuing to beat the chickpea water on medium speed, slowly pour in the sugar syrup into the mixing bowl. Once all the sugar syrup has been incorporated into the chickpea water, keep on beating the mixture. After about 10 minutes of total mixing time, the torrone should be light in colour and should have thickened considerably. Quickly fold in the toasted nuts and spread the torrone on the prepared sheet pan. If you want a slightly more regular shape or flatter surface, cover the torrone with a second piece of lightly oiled parchment paper and use a rolling pin or your hands to shape the torrone. Leave to harden for ca. 3-4 hours before cutting. Stored in an airtight container, the torrone will keep for several weeks. I had absolutely no idea that you could use chickpea water in this way although I guess it makes sense because of the protein. I can’t wait to see how you use this amazing discovery! It was totally new to me too until a few weeks ago! I am curious to see whether you could use it for things like vegan choux pastry or vegan pastry creams. It is so intriguing, right? I have stopped pouring it down the drain and now just keep it in the freezer for future experiments!